AL Zorah Golf Club is located in the emirate of Ajman in the United Arab Emirates, a mere 25 minute drive from Dubai airport and just a short distance north of the city. Al Zorah is becoming a destination, much like Jumeirah or Yas Island, with a focus being on relaxation,serenity, and a natural environment. Dubai is indeed a remarkable place, but Al Zorah provides a welcome tonic with the option to stay at the impressive new hotel at The Oberoi Beach Resort. As temporary clubhouses go, the slate-grey structure overlooking the vast mangroves and Nicklaus Design golf course is very impressive. A permanent clubhouse will soon be the centrepiece of the golf course, but for the time being, the set-up is more than adequate. Sitting out on the terrace that overlooks some of the early holes and the occasional passing heron inspires you to want to swing away, your eye drawn to the course by a raised buggy track that snakes its way out across the tidal flats. It’s an early introduction to the nature of what lies ahead. Opened in December 2015, the course bears all the hallmarks of a Nicklaus design – the expansive bunkering, wide fairways, and large green complexes – and was created with particularly sensitivity to the environment. While the layout might be typically Nicklaus, it’s the tidal lagoon or “khor” that provides the true character of the course. At high tide the water laps at the edges of many fairways, adding to picturesque qualities of the course as well as the drama and challenges. At low tide, however, you might be prepared to stroll out and play what would otherwise have been a submerged ball. One might assume that time will be needed to mature the course, but the tees, fairways, and greens are all in superb condition already. The tight, pristine turf rewards crisp striking, and the greens roll as purely as any you’d find in the world. You might need time to acclimatise to the nature of the platinum paspalum grass and the grain but learning how to putt and chip into such grasses is a skill to develop and enjoy. Certainly during the time of my visit (March) the winds reliably whipped up in the afternoon. Play golf in the morning, and you’re likely feel nothing more than a gentle kiss of the breeze, but from midday onwards you were faced with a two-club wind. Like the tides, it means the course constantly changes the way it plays, but the variety only adds to the fun of playing Al Zorah. Al Zorah presents some of the best value golf in the UAE, especially given the quality of the design and conditioning. Green fees are roughly a third less than nearly every other course in the UAE. Beyond the course, the newly opened Oberoi Beach Resort is a luxurious beachside haven just minutes from the golf club. It’s the perfect place to stay locally, where every one of the 89 rooms has floor-to-ceiling windows presenting the finest views of Ajman. As you’d expect, dining options are numerous, and the spa, pools, beach, and gym facilities are more than enough to keep you relaxed when you’re off the fairways. Al Zorah is undeniably striking. From the perfectly manicured tee boxes rising out of the mangroves to the sharp, deep and expansive bunkering that separate land and water, visually it’s very impressive. 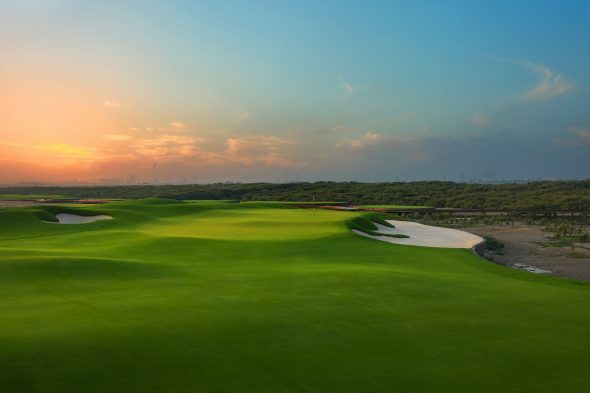 Al Zorah’s most striking feature – and in this it’s reminiscent of a course a world away at Royal West Norfolk Golf Club – is the tide and the resulting changes to the landscape. The course has been designed with this in mind and plays very differently depending on the level of the tide. While the hazards remain constant, when the the tide is in and the water at its highest, there’s certainly a greater psychological threat. Whereas other courses in the UAE may be compared to one-another, the course at Al Zorah occupies a place of its own in every sense. The course itself is especially green, with wide fairways snaking through the mangroves. And while constructed on a predominantly flat parcel of land, there are so many undulations in the design that roll, twist and turn, that you forget that fact very quickly. In that respect it compares with many traditional links courses. Playing the course there are an abundance of challenges – raised greens, deep bunkers, and punishing green side run-offs are a theme throughout. This said, perhaps the course’s greatest strength is its playability for golfers of all standards which is a testament to the quality of its design. You won’t get “beaten up” at Al Zorah, as you might at some other local championship venues, and you’ll enjoy it all the more because of it. You will find fairways, reach greens in regulation, and have fair recovery shots when it goes astray. That’s not to say the course is easy, it’s just fair. The par three holes are particularly strong, while the par fives with their wide fairways provide a chance for everyone to open their shoulders. Hitting from a platform tee rising up from the tidal flats is an impressive start to this par 5. The drive rises gently to a plateau in the fairway before turning softly to the left, but you’ll need to avoid the two sizeable bunkers to the left of the landing area. The second shot is the perfect representation of Al Zorah – space either side of a raised green protected by two good sized bunkers and a large run-off area. An ideal shot would be tight up the right hand side, but anything less than perfect is likely to leave a very awkward pitch. A characteristic of Nicklaus design, the bunkering seems to guide you around the course, funnelling tee shots to the right portions of the fairway or presenting targets. This is especially true at the par four 8th hole, a dog-leg right which, depending on the wind direction, has you driving towards the two large traps on the left or taking on the bunker centred in the fairway. But don’t bite off more than you can chew as the entire right-hand side is a tidal grave. You’re quite likely to have a sloping lie with the second shot, to a gentle two tier bean shaped green protected by more sand traps. The par three holes at Al Zorah are arguably the stand out features of the course, with water coming into play on all four of them. The short 15th hole is a visually impressive hole playing at different angles (courtesy of numerous teeing options) across the tidal flats to a raised two-tier green with views into the mangroves. Bunkers might prove a blessing and save an errant tee shot a watery grave. The pick of a fine set of short holes. Al Zorah is another example of where modern golf course designers are getting it right. Gone are the days of building another big ‘championship’ golf course that’s too hard for the average golfer, and only gets played the way it was intended to be played once in a decade. Instead, the emphasis is on playability and enjoyment for the handicap golfer. That’s not to say the course can’t be tricked-up for the professionals, it certainly can be, but it’s a more inclusive philosophy, and certainly the right one for the future of the game. Visually, the bunkers and tidal areas are particularly impressive, as well as the platform tees that rise up from the water, and the connecting buggy paths. It’s a pleasure to be whisked away from the city and the now traditional desert-style courses to the natural greenery of the mangroves and an altogether different golfing experience. Naturally, any golfer visiting the region will want to play some of the headline courses in Dubai and Abu Dhabi, and rightly so, but it would be a crime to overlook Al Zorah. It offers comparable quality, tranquillity, and something very different for the Middle East, and at a price point that proves better value than all of its rivals. It’s one to include on any UAE trip.